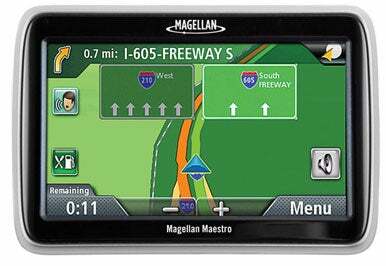 Magellan's Maestro line of GPS devices has always been designed to appeal to consumers who are willing to pay more for more features. And that's still true of the new Maestro 4700. However, Magellan has also added more features to the models in its budget-friendly RoadMate line—so much so that you have to wonder whether the Maestro 4700 is worth even its slight price premium. The Maestro 4700 has an impressive list of features. You get a larger-than-normal, 4.7-inch screen; maps for the United States (all 50 states), Canada, and Puerto Rico; a database of 6 million points of interest; highway-lane-assist signs; text-to-speech; and multisegment routing capabilities. You also get several items unique to Magellan, such as the AAA tour book and the One Touch feature, the latter of which lets you easily navigate to a favorite destination or search with just a single tap of the screen. But here's the thing: All of those features are also available on the $250 RoadMate 1470 (not to mention the $300, 7-inch RoadMate 1700 [ ]). The 4700 also features predictive traffic routing, a function very similar to TomTom's IQ Routes that generates routes based on historical speed and traffic patterns. The intended result is more-optimal routing and more-accurate ETAs. In my tests, predictive routing accurately anticipated rush-hour delays. Even so, sometimes your best option for getting somewhere is to tough it out and tolerate traffic delays anyway, and there's nothing Magellan's products can do about that. I do hope that Magellan will include this feature in upcoming RoadMate models. Voice recognition is in the 4700, but I thought it was somewhat underwhelming, as the feature allows you to control only a few things by voice. A tap of the speaking-man icon on the map view brings up the "Say a command" menu, which contains entries for "go home", "previous destinations", "nearest bank", "nearest gas", "nearest coffee", "nearest restaurant", and "where am I". Though it responds to some additional commands such as "go back", "next", and "map", the device itself offers no listing of the available commands. Voice control of a portable GPS unit may be a viable interface option someday, but not today. Navigation with the Maestro 4700 is almost identical to the experience you'd have with current RoadMate models. The menu structures are virtually the same, with the exception of the additional features found on the Maestro. In my road testing, I mounted both the 4700 and the 1470 and drove some test routes. In many cases the spoken directions were in unison, but on occasion one unit was about a half second ahead of the other.